Warranty: 1 year warranty on product and 5 years on Magnetron. 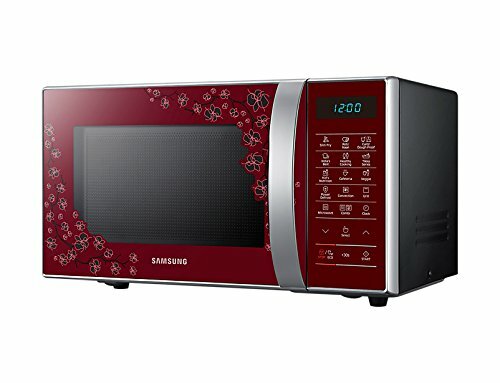 Samsung 21 L Convection Microwave Oven (CE77JD-CS/TL, Silver) comes with crusty plate feature that is very good to heat frozen foods like pizza that tastes just like originally prepared. This Cursty Plate feature is really amazing in this Samsung microwave oven that gives tasty and crispy texture foods anytime you want. On the other hand, it has a ceramic cavity which is scratch-resistant and easy to clean and durable also. 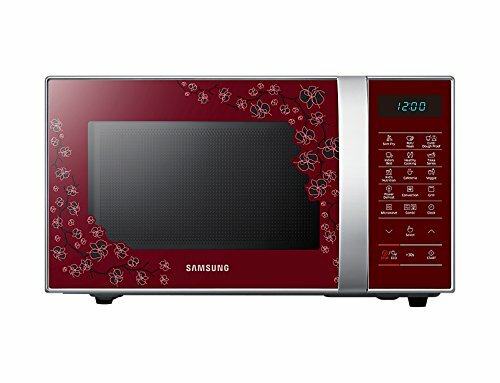 This Samsung microwave oven lets you enjoy local tastes without any doubts. It lets you select from various pre-programmed local recipes, which are great for enjoy known flavors at the simple touch of a button. Apart from all these advanced features, Samsung CE77JD-CS/TL comes with Curd Any Time feature that lets you prepare home-made dough or curd anytime you want with the help of its unique fermentation technology. Amazingly, it carries Tandoor Technology that is very helpful to create conditions that are tandoor friendly at the temperature of 200° C. With the addition of such technologies, it is possible to make delicious crispy roti or naan by just pressing one button.